1300 E. Northern Parkway, Baltimore, MD 21239. Please Fill in ALL required information. You may add additional campers to this Form as needed. Does the camper have any Medical or Custodial issues we need to be aware of? Please feel free to contact us to discuss further. To add a Secondary Contact please select "Add another response" below. A secondary contact is important to have as a back-up should we need to reach someone quickly in case of illness or an emergency. How did you hear about our Camp? Final Production: Willie Wonka Jr. Final Production: Mary Poppins Jr. Sibling Discount: 10% Off second child (living at the same address) after full payment of Child #1. CALL FOR DISCOUNT - 410-472-4737. Consecutive Session Discount: 15% Off second camp for the SAME child during the same year. $300.00 of the Deposit is NON-REFUNDABLE. The Deposit and Balance will be invoiced to you via the email provided. ALL camp registrations must be paid in FULL prior to the start of each session. 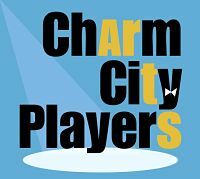 Charm City Players, Inc. is a 501(c)(3) nonprofit organization. CCP does not discriminate on the basis of disability in admission or access to, or employment in, its programs or other activities. REGISTRATION: iMAGiNATiON 101 Summer Arts Camp: CCP requires a non-refundable $300 deposit fee per child (per camp session) at the time of registration to hold space in a camp. You may pay in full or the minimum payment of $300 (this is a non-refundable deposit). The $450 balance is due by May 1, 2019. All Camp Registrations MUST be paid in FULL prior to the start of camp. All KinderCamp Registrations MUST be paid in FULL with Application. All Registrants will receive an email confirmation prior to the start of the class/program. If you need a copy of your receipt for tax purposes or have any questions, please contact the CCP office at 410-472-4737. RETURNED CHECKS: There will be a $50 charge for any returned checks. REFUNDS (iMAGiNATiON 101 SUMMER ARTS CAMP): Refunds are made only when requested in writing by June 1, 2019. At that time payment will be refunded less the $300.00 non-refundable deposit fee (per camp session). No refunds will be given after that date EXCEPT for medical reasons with a doctor’s notification. Medical refunds will then be prorated from the date CCP receives the doctor’s notification. ALL REQUESTS MUST BE MADE IN WRITING. Approved refunds take 4‐6 weeks. BROADWAY JR. SHOW SELECTION: CCP reserves the right to change the Broadway Jr. Show selection for any camp based on the contract requirements from the managed rights provider. LOST OR STOLEN ITEMS: CCP is not responsible for articles left or stolen at any class or rehearsal. PHOTOGRAPHY/VIDEO: All photographs and videos taken during class, rehearsals and performances may be used by CCP for publicity purposes. RELEASE: By submitting a registration for your child(ren), you waive, release and forever discharge CCP, its directors, officers, employees and staff from any and all claims for damages and injury which you or your child(ren) may have or which hereinafter may accrue to you or your child(ren) against CCP as a result of alleged or actual negligence on the part of CCP, its directors, officers, employees and staff occurring during or in connection with any participants by you or your child(ren) in CCP activities including classes, rehearsals, performances and related programs and events on any site utilized by CCP. GUESTS: CCP does not allow guests (siblings, parents, family, friends, etc.) in class, rehearsal or camp. For inclement weather cancellations, call 410-472-4737 or visit our Facebook Page (www.facebook.com/CCPBaltimore) or our website (www.CharmCityPlayers.com). I agree to The Charm City Players' Registration Policy. Please enter your name.